Now on the the most well-known of Gribeauval’s designs: the 8pdr. According to the old wargamers’ beliefs, which are remarkably persistent, this was the main piece in use by the French throughout the wars. Every 15mm figure manufacturer has a go at this one. The 8pdr seems to have been well liked by the artillery men that served it, who forgave its weight. One aspect of the weight was that a second set of trunnion recesseses was required, and the barrel (580kg) had to be moved between them each time the weapon was limbered or unlimbered. No doubt this was easy enough for a practised crew. The weapon had more hitting power than almost all its field opponents (usually 6pdrs – the British 9pdr was the exception, and this could match it). Perhaps that gave the crews a better sense of security in the counterbattery exchanges which were so much a feature of the wars. But the weapon was less popular with the war ministry. The extra weight meant more expensive metal. A typical 6 pdr weighed just 400kg. And no doubt this discrepency applied all the way down the line: the cost of ammunition, and the number of horses and caissons need to shift things around. So in the An XI reforms of 1803 it was decided to phase the 8pdr out. This meant that probably not all that many of them were manufactured. In the pre-Empire era the French were notoriously short of artillery. This persisted into the early Empire when several corps were kitted out with captured artillery, such as Austrian 6pdrs. And after that they were officially obsolete. So they would have missed out on the big manufacturing push in the early Empire period. Still, they continued in use after 1803. No doubt the field units were reluctant to give them up, and the first priority was to replace the captured guns with the new 6pdrs. 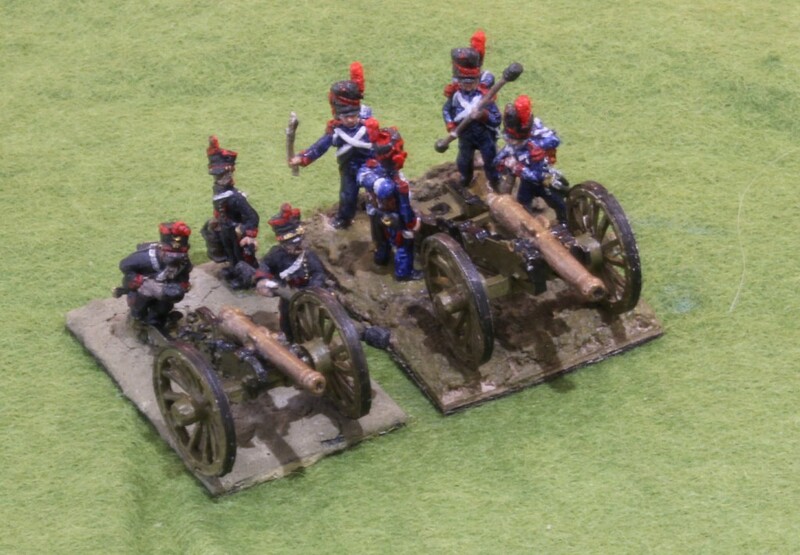 According to the orders of battle for the 1809 Austrian campaign, quite a few units were still equipped with 8pdrs. 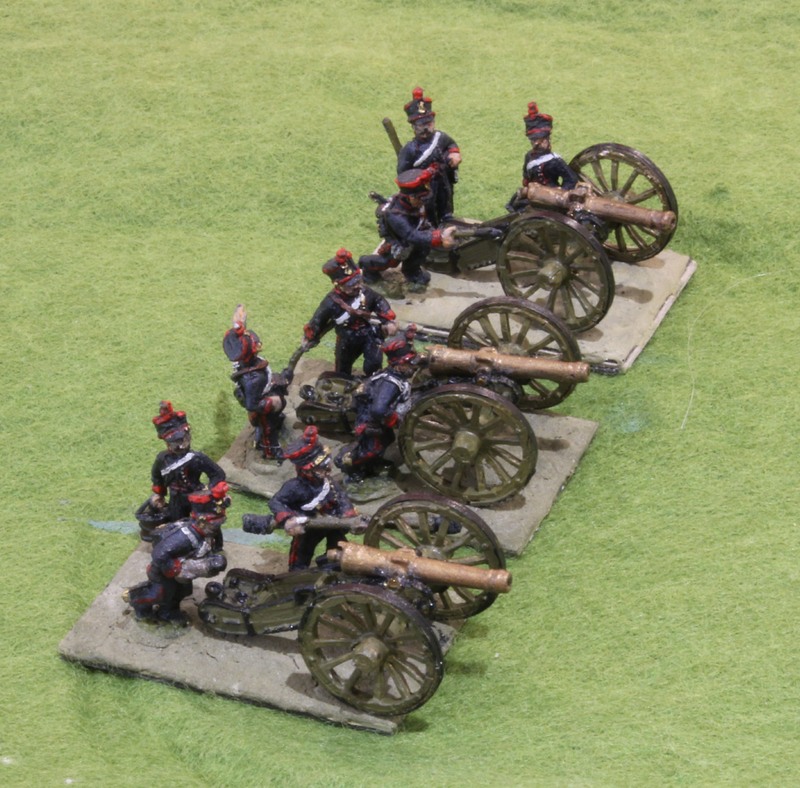 This included the horse artillery supporting the cuirassier divisions – showing that the piece’s weight was not too much of an obstacle even for use by the horse arm. By 1812, though, they were gone, except in Spain. There were none at Waterloo. As with the 4pdr, though, they experienced a bit of an afterlife in the Pensinsula. This was partly because the Spanish had them, and it was convenient for the French to take these over. Some divisional batteries used them, but they were also used in a reserve artillery role, in place of the 12pdr. Nearly as many of them were at Vitoria as 4pdrs – though how many of them were actually in use, rather than left on the Park, is an open question. (As it happens I suspect that all, or almost all, of them were brought into action in that battle, mostly as reserve artillery, and the 12 pdrs were left in the Park). That wasn’t the end of the story though. The post-Napoleonic regime brought them back for use in the horse artillery, and their use continued beyond 1827. There are no photographs of surviving 8pdrs with original carriages – which means that probably none have survived. Oddly enough I haven’t even seen any detailed drawings either. There is a rather fine model in the French Army Museum, which gets a lot of pictures in the publications, though, so I suspect that detailed drawings do exist. A few barrels survive, including one in Britain’s National Armouries. For my models I wanted just three of these, enough for the artillery-light Peninsula and revolutionary wars battles, and to play a role in any 1809 scenarios. I decided to assemble them from bits and pieces I had to hand, rather than buying them new. I took the carriage from my Old Glory pack. These are quite nice, at about the right scale. It is nicely detailed, and I find the proportions are pleasing to the eye. There’s a slight splay on the trail, which not all models attempt. A trail spike is moulded stowed on one side, which won’t be to everybody’s taste (the same is true for my Battle Honours 4pdrs). The main problem is that the elevating plate is too low for the firing position – though works perfectly well for the travelling position on the rear trunnion recesses. The trouble with the OG models is that the wheels are too small (though at least they can be reused for the 4pdrs! ), and the barrel doesn’t work. The wheels look quite nice – but I want to acheive the big-wheeled look in my models. Truth be told I’m not entirely sure which barrels came from which models with my old bits and pieces, but I’m not that impressed with the ones I think are from OG (nor the ones I know came with the OG Prussian pack). The three OG carriages I was using (with their original wheels) had barrels borrowed from (I think) BH 8 pdrs (where the carriage is not as nice). I took the wheels from the Blue Moon French howitzers. This pack was a major disappointment, of which more later, so sparing three pairs of wheels was not a difficulty. As for the barrels, my BH ones would have done at a pinch, but they were a tad small. The main problem with them was that they did not look much different in size from the Blue Moon 6pdr barrels – and I needed them to look substantially bigger (while being clearly distinguishable from 12pdrs). I found one really nice barrel, though I don’t know where it came from (it might be a very underscale BH 12 pdr). The other two were, remarkably enough, taken from my series 2 Minifigs Austrian 6pdrs, which says something about the accuracy of those old ranges! I cut the rear portion of the elevating plate from from plastic card and glued it to underneath and the back of the barrel. How would I recommend readers model the 8pdr from scratch? No need to repeat my palaver. Based on LittleArmies‘ reviews, the Blue Moon 8pdr is probably perfectly good, if your budget can stretch a pack of 6 for £12 in the UK. AB also do an 8pdr, though I haven’t seen it and neither did LittleArmies. But I have seen their 6pdr and 12 pdr and a picture. It is likely to be nicely detailed, with the trails dead straight and a little narrow. But the wheels will be about the right size, and the elevating plate probably in the right place. And you can buy them one at a time (at £2.40 here in the UK). If you are using the 12pdr and 6pdr from AB (which I will post about in due course), then this may be the best choice. As I have already said, I don’t like the BH 8pdr, even if it was readily availalble; the OG version has the problems I have mentioned, as well as being sold in packs with crew (though these should be usable, unlike the BH ones). Incidentally, LittleArmies has two different versions of the OG artillery, neither of which match mine, though he wasn’t entirely sure where his originated from. So there’s also a risk that what you get now does not match ones I had in my 1809 Horse artillery pack, bought before Timecast days. The Warmodelling/Fantassin models are really quite horrid, and I would avoid them. LittleArmies says the XAN version works well, though I would find the wide carriage a bit off-putting. I haven’t seen the Minifigs version, but they tend to be a bit small. There will be many others out there which I haven’t seen, of course.